Wilcom's full complement of broadband accessories includes central office and customer premise DSL splitters for peak Internet performance of video and other data-rich content. 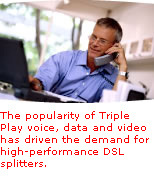 With increasing demand for faster Internet connections, more bandwidth and bundled services such as Triple Play, service providers have implemented newer DSL technologies such as ADSL2+ and VDSL2. Wilcom helps you keep up with high-performance DSL equipment.